Vitamin C is a natural antioxidant, helping your body defend itself from cell damage through exposure to environmental toxins and free radicals. Free radicals are produced by your body during the breakdown of food. It also helps your body produce collagen to make skin, tendons, ligaments and blood vessels, as well as heal wounds. 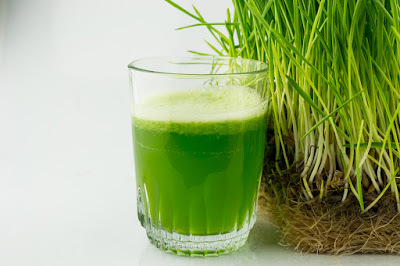 A single serving of alfalfa juice contains 13.5 milligrams of vitamin C. This is 15 percent of the daily adequate intake for adult men and 18 percent of the daily AI for adult women. It is also almost 16 percent of the AI for pregnant women and 11.25 percent for breast-feeding women. An essential mineral, magnesium helps with the production of energy and protein in your body and the contraction and relaxation of muscles. Magnesium also helps certain enzymes function. A 2-ounce serving of alfalfa juice contains 45 milligrams of magnesium, which provides 14 percent of the recommended daily requirement for adult women and almost 11 percent for adult men. It is also 11.25 percent of the recommended daily requirement for pregnant women and 12.5 percent for breast-feeding women. Also known as vitamin B-1, thiamine helps your body convert carbohydrates into useable energy, as well as break down and use fats and proteins. As a member of the B vitamin group, thiamine helps with maintaining healthy skin, hair, eyes and liver. Thiamine may also help with supporting your immune system and improving your body’s ability to handle stress. A 2-ounce serving of alfalfa juice has 0.125 milligram of thiamine. This is a little over 11 percent of the recommended dietary allowance for adult women, almost 9 percent for pregnant and breast-feeding women, and a little over 10 percent of the RDA for adult men.